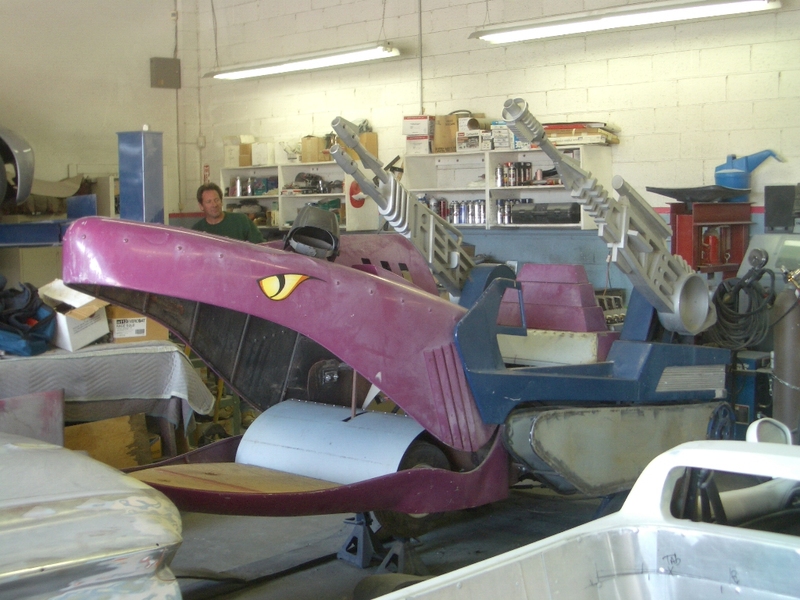 ToyFare contributor, Poester and vintage toys superfan Ben Leach pointed me to this post at Lounge Grayskull, featuring photos of a full-size, real-life Land Shark from Masters of the Universe, which is being restored to unholy life by Unique Movie Cars Las Vegas. The fact that the mouth moves while driving is easily the most insanely awesome thing ever to be featured on a car, and yes, that includes the soothing voice of William Daniels. The most insanely pimped-out hydraulics-propelled gangsta car imaginable holds nothing on a giant purple chomping shark-car. But there’s still a mystery here–when was this built, and why? Anyone know? UMC seems pretty sure Mattel commissioned it. Any chance it was used in the Macy's Thanksgiving Day Parade the year He-Man was in it? That was going to be my guess, too. Parade seems like the likeliest option. Maybe it was used to advertise the Power Tour (or whatever the He-Man/She-Ra stage show was called). Probably came from one of Mattel's really expensive parade deals or tours. Man they used to pour out money for MOTU back then. I remember going to a haunted house deal one time and the whole thing was HE-MAN! I kid you not. An elevtronic Beastman jumped out at some point and nearly caught the collar of my shirt. Scared the crap out of me. you know, i'd like to respond in a manly tone, noting how "kewl!!" or "awsum!!" this is… but that wouldn't make my point. i hopped up out of my chair, squeeled like a girl, and ran into the living room to show the wife, all while dribbling pee like an excited puppy. there may have been the world's first cripple-cartwheel in there, i'm not sure. Speaking of pee dribbling… I would piss my pants if I saw this in the rear view mirror!! Maybe a number two as well..
Was the Original toy ever done as a die-cast? Mattel owns Hot Wheels and the HW team does 1-2 of their designs at life-size for the Car Show circuit each year. They have not been above pushing one of their other licenses at the same time in the past.